Whenever you need information on a particular vendor's account or a particular invoice, Vendor Account Inquiry is the application to use. This application displays the vendor's name, terms, invoice date, due date, voucher number, and any credit memos or checks that have been applied towards the invoice. The four types of transactions shown are V = Regular Voucher (Vendor Invoice), Cm = Vendor Credit Memo Voucher, Cc = Computer Check, Mc = Manually Written Check. The discount taken, net A/P amount for each invoice, the purchase order number, and the reference field is also displayed for each transaction. 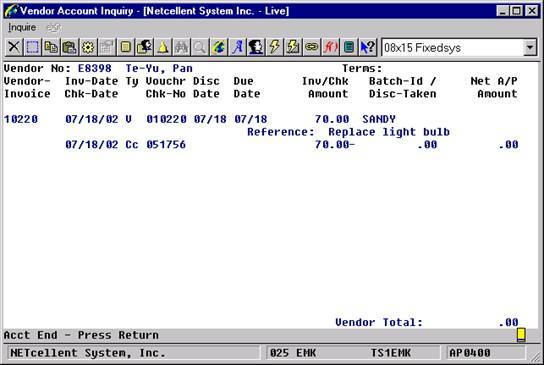 Vendor invoices which have been fully paid off but not yet purged from the file can be displayed or not, at your option. Up to 15 transactions can be displayed on the screen at one time. The F1 key is used to step through the account one page at a time, if there are more than 15 transactions. If you miss an item during a multiple page inquiry, press the F2 key to return to the previous page. If the entire account is looked at in this manner, the vendor total A/P amount will be displayed when the end of the account is reached. If you wish to inquire about a particular vendor invoice, the invoice number can be entered, and the account will be displayed from that invoice on. If this is done, invoices with lower numbers will not display and the vendor A/P total will not be shown. Enter the vendor number of the vendor whose account you wish to inquire. The vendor’s name and terms display automatically. If you do not know the vendor name, press the F7 key to do a search for the vendor by number or press the F8 key to do a search for the vendor by name. If you want invoices, which have been fully paid to also appear on the screen, answer Y; otherwise, answer N. Note that invoices, which have been fully paid, will eventually be purged from the file. Only those fully paid invoices, which have not yet been purged, will even display. If you need information on paid invoices, which have been purged, you will need to consult previous purge journals. To see information on a particular vendor invoice, enter the invoice number here. 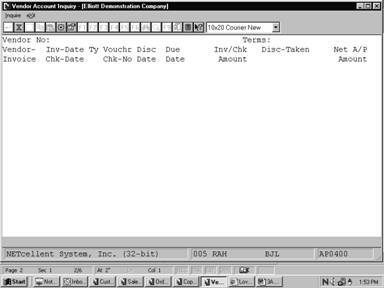 If the invoice is on file, its data will be displayed and you will have the option of seeing the remainder of the account. If it is not on file, the data for any invoices with higher numbers on file for that vendor will be displayed. To inquire on the vendor account in general or if the invoice number is not known, press RETURN and the entire account will be displayed. When a specific invoice number is entered, the vendor total will not be displayed when the end of the account is reached. If more than 15 transactions exist for this vendor, you can press the F1 key to see more transactions and by continuing this you can browse through the remaining invoices for this vendor and their associated payments. To see the previous page enter the F2 key. This field will be displayed auto­matically, no entry is allowed. For vendors and vendor credit memos the document date will be displayed here. For checks, the date the check was written will be displayed. This field is displayed auto­matically, no entry is allowed. This field is displayed automatically, no entry is allowed. For vouchers and vendor credit memos this is the voucher number assigned during A/P Trans­action Processing. For checks, this is the number of the check. A date in the standard date format but without the year. This date is the last date that any early payment discount can be taken. A date in the standard date format, but without the year. This is the due date of the document. This amount indicates the effect that the open item has on the A/P balance. Invoices increase the A/P balance and are shown as positive, vendor credit memos and checks decrease the A/P balance and are, therefore, shown as negative. This amount applies only to checks, and shows the amount of discount taken when the check was written or printed. This amount is subtracted from the invoice amount (as is the check amount) to get the net A/P amount. This is the net effect that the invoice has on the vendor's A/P account. 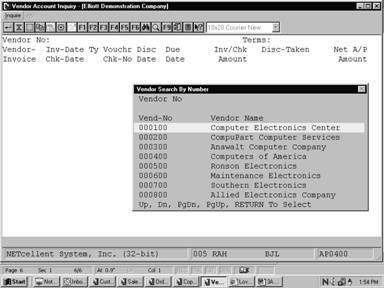 The net A/P amount is only shown once for each invoice no matter how many vendor credit memos and/or checks apply to it. If account inquiry has been done from the beginning of the file straight through to the end, the vendor total will display on the screen. This is a total of all of these net A/P amounts for the vendor. The PO number will be shown after the appropriate voucher number. The reference defined in A/P Transaction Processing will be displayed after the voucher. 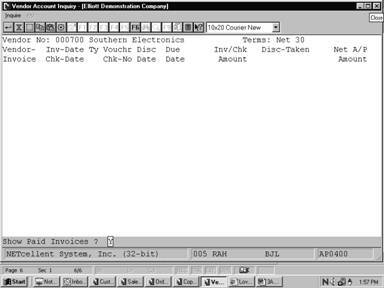 On top, Elliott prompts for Vendor#, Show Paid Invoices?, and Starting Invoice#. One voucher per line is displayed. (6) A/P Account + Desc. (7) The Check Number, Check Type (Cc or Mc), Check Date, Check Amount and Check Discount Taken. However, there can be more than one check and information about the other checks can be viewed by pressing the F2 key. (8) A/P Distribution Account Number and Distribution Amount, History for the voucher. If there is more than one distribution, the literal “(Multiple Distributions)” will display between the open items and the footer information. The user can press the Enter key to get a breakdown of the distributions. (9) Quantity (of the items orders), Item Number (of the first item ordered), Unit Of Measure and Job Number. You can press F3 to drill down to the PO information.